Leading figures in Donald Trump’s Republican party have reacted angrily to his latest comments blaming both sides for the violent clashes in Charlottesville, Virginia, on Saturday. They culminated with a person being killed and many injured when a car hit people opposed to a far-right rally. Mr Trump had condemned white supremacist groups on Monday. But on Tuesday he reverted to his initial reaction. The right-wing march had been organised to protest against the proposed removal of a statue of Gen Robert E Lee, who commanded the pro-slavery Confederate forces during the American Civil War. The event drew white supremacy groups. Violence broke out after they were confronted by anti-fascism groups. A BBC correspondent at the scene described how members of the so-called “alt-right” openly carried rifles and were dressed in full tactical gear. Their leftist rivals threw bottles, rocks and paint. Pepper spray was used by both sides. “I think there is blame on both sides,” Mr Trump told reporters at a tense press conference at Trump Tower in New York. “What about the alt-left that came charging… at the, as you say, the alt-right? Do they have any semblance of guilt? (…) There are two sides to a story,” Mr Trump said in response to one reporter. Who is the car-ramming attack suspect? When is it right to remove a statue? He condemned the driver of a car that ploughed into one group of anti-racism protesters, killing 32-year-old Heather Heyer and injuring 19 others. 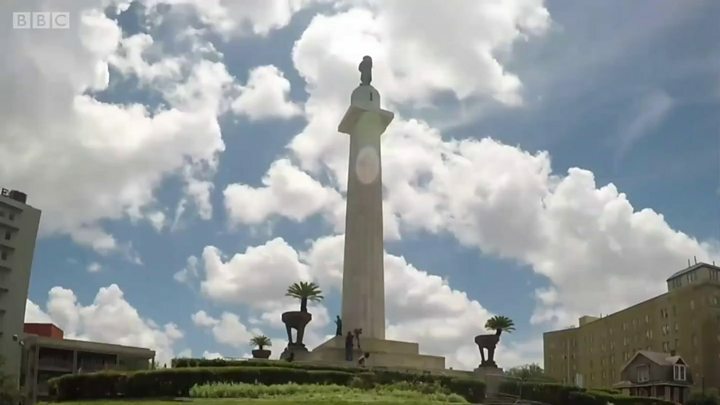 But he said that those who had marched in defence of the statue had included “many fine people”; and he asked whether statues of former presidents George Washington and Thomas Jefferson should also be torn down, because they had been slave-owners. His comments were said to have caught senior White House officials off guard. One official, who was not authorised to speak publicly, told CNN it had been agreed that Mr Trump would talk only about infrastructure, which was the reason for the news conference. The Associated Press reported that as Mr Trump spoke, new chief of staff John Kelly barely glanced at the president, press secretary Sarah Huckabee Sanders tried to make eye contact with other top aides, and one young staffer stood with her mouth agape. 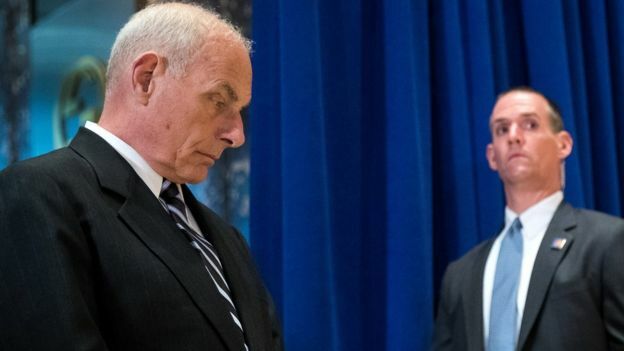 Image captionWhat was new chief of staff John Kelly thinking during Mr Trumps’ news conference? But many others strongly condemned the comments. Of the reactions of some 55 Republican and Democrat politicians collected by the Washington Post, only the spokeswoman for the Republican National Committee, Kayleigh McEnany, expressed her support. One of Mr Trump’s former rivals for the Republican presidential nomination, Marco Rubio sent a series of tweets. Richard Trumka, president of the AFL-CIO trade union federation, became the fifth prominent business leader to resign from President Trump’s advisory body, the American Manufacturing Council, over the issue. He said he could not take part “for a president who tolerates bigotry and domestic terrorism”. In another development, the response of former President Barack Obama to the violence in Charlottesville has become the most-liked tweet ever.